Perthshire-born fish curer and provision merchant, shipowner, who became a prominent magistrate in his adopted home of Dundee. He subsequently became provost and then Liberal MP for Dundee. Liberal Party, although James Yeaman was independent in mind, and true to his own heart. It is said that he put his country first, and his party second, and sometimes if he felt compelled, he would vote with the Conservative party on certain issues. In the 1880 elections he ran for the Conservative Party, and failed to be re-elected. 1861: Commissioner of the Dundee Shipping Insurance Association. 1869-1886: Guildry Incorporation assessor. Deacon of Bonnetmakers - Nine Trades of Dundee. 1873: Masonic Lodge. Tay Bridge Relief Fund. 1867-68: Dundee Chamber of Commerce. Local Marine Board. 1871-75: Seamen's Friend Society - Temporary Chapel and Library - Committee of Management. 1867: President, Dundee Harmonic Society; also served 1874-77. Dundee Co-Operative Rowing Club - Patron and Trustee. 1871-1875: Vice President Dundee Humane Society. 1871-1885: President, Dundee Horticultural Society - after this time listed as Patron. 1864-65: Town and County Fire Insurance Company, at the time, this company was the only fire insurance company in Dundee. 1871-1886: Royal National Life-Boat Institution. 1869-70: Dundee Public Library Royal Lunatic Asylum - as the Moderator of the Synod of Angus and Mearns. 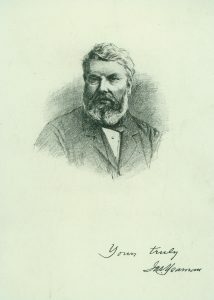 1874-75, and Ordinary Director for the Nine Trades of Dundee 1880-1883. Dundee Institute for the Blind - Director, 1874-75. Indigent Sick Society, 1876-77. Ancient order of Foresters Friendly Society- Honorary Member, 1876-77. Dundee Working Men's Angling Club - Patron. 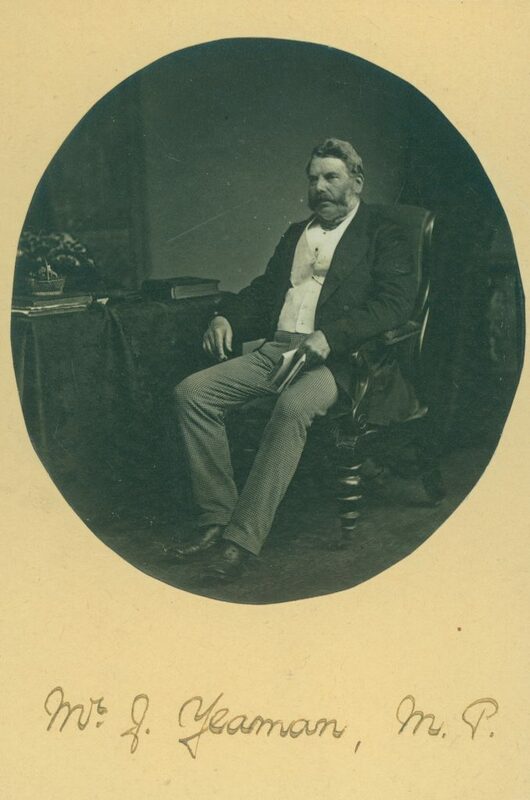 1859: Town Councillor, Dundee Town Council, First Ward. 1860: Fourth Bailie, Dundee Town Council. 1861: Third Bailie, Dundee Town Council. 1864: Second Bailie, Dundee Town Council. 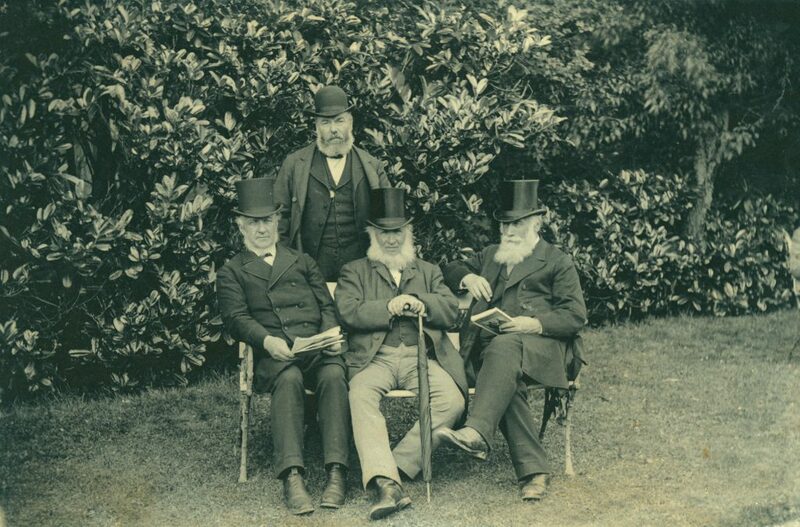 1865: Term is up for serving, leaves Dundee Town Council. 1868: Returns to Dundee Town Council, Third Ward. July 1869: Appointed ad Interim Provost Dundee. Nov 1869: Provost Dundee by unanimous vote. 1869-1872: Provost of Dundee. 1873-1880: Member of Parliament for Dundee. 1881-1884: Justice of the Peace, Dundee. 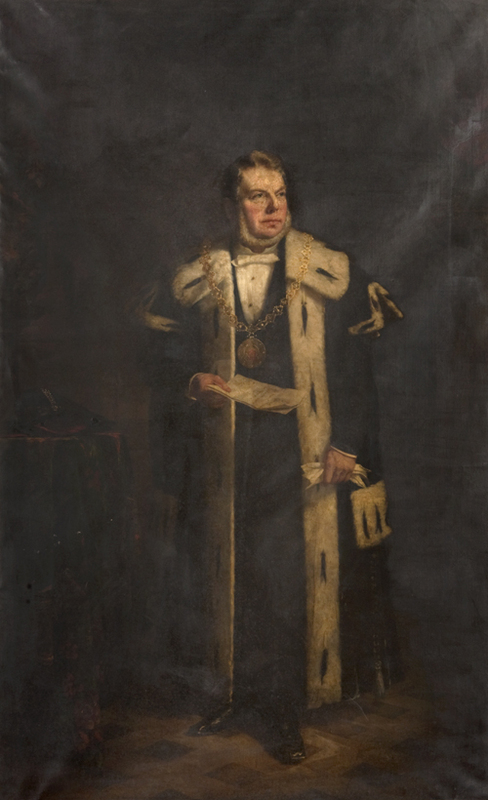 Committees served on in his capacity as a Councillor included: 1861-62: Fourth Bailie, Commissioner for Police of the Burgh of Dundee; 1871-72: Provost and Chief Magistrate . 1861-65: Dundee Hospital Funds Committee for Seagate District. 1861-62: Bailie, Town, Hospital and Kirk Fabric Rights, Properties and Improvements Committee. 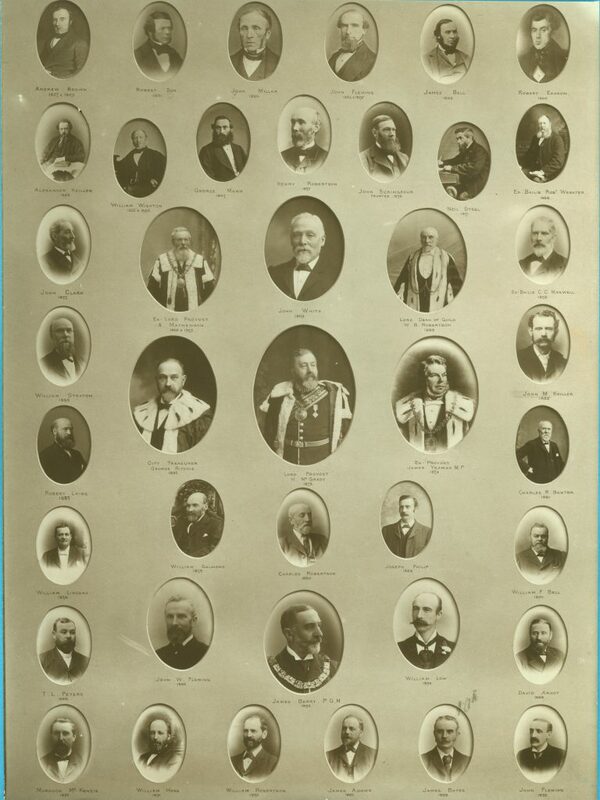 1869-70: Convener & Bailie, Finance Committee; 1861-65: Bailie. 1861-65: Bailie, Parliamentary Bills Committee. 1864-1872: Harbour Trustee. Council Directors of the High School. 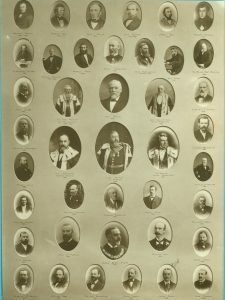 1871-72: Law Committee . 1871-72: Water Commission. 1871-72: Gas Commission. 1871-72: High School. 1871-72: Chairman, Free Library, Albert Institute. 1871-72: Council Member for Forfarshire Prison Board. 1861-65: Council Representatives as Members of the Commissioners of Supply: Lighting, Sanitary (including Cleansing, Lodging Houses, Slaughter Houses and Hackney Carriages). Bailie. 1861: Dundee Parochial Board and Poor House Committee. 1874-75: Chairman, Dundee School Board. Subscriber no.257 – Robert Yeaman was also a subscriber, although no close genetic link is known at this time (the two men were no closer than cousins at best). Sharing of the name Yeaman, traces both back to the Rattray area generations earlier. The two men surely knew each other, as later in life, they lived almost next door to each other in Ferry Road, Dundee, and also Robert Yeaman’s business partner Mr Halley, served on many committees with James Yeaman the MP. Subscriber no.179 -Provost Charles Parker – James Yeaman was a fellow elected member of Dundee Town Council. Subscriber no.104 – Peter Hean was Dean of Guild when Yeaman was a bailie. Proposer of Yeaman as a bailie in 1860. Subscriber no.124- Christopher Kerr was conjunct town clerk while Yeaman was a bailie. Subscriber no.236- William Scott was the town’s architect while James Yeaman was a bailie. Subscriber no.71- Alexander Easson served on Dundee Parochial Board at the same time as Yeaman. Subscriber no.162 – William R Morison served on Dundee Parochial Board at the same time as Yeaman. Subscriber no.56 – Thomas Couper was chairman of Dundee Shipping Insurance Association while Yeaman was one of its commissioners. Subscriber no.110- John Jack junior was a commissioner of Dundee Shipping Insurance Association while Yeaman was also one of its commissioners . Subscriber no.203 – David Scott was a commissioner of Dundee Shipping Insurance Association while Yeaman was also one of its commissioners. Subscriber no.168 – William Nicoll was a board member of the Town & Country Fire Insurance Co. at the same time as Yeaman. Subscriber no.11 – George Lloyd Alison was a board member of the Town & Country Fire Insurance Co. at the same time as Yeaman. Subscriber no.139 – John Mitchell was a board member of the Town & Country Fire Insurance Co. at the same time as Yeaman. Subscriber no.105 – William Halley was third bailie when Yeaman was fourth bailie on Dundee Town Council and was a board member of the Town & Country Fire Insurance Co. at the same time as Yeaman. Subscriber no.17 – David Bruce was joint manager with James Yeaman in the Dundee Seal and Whale Fishing Co., whale yard, East Dock Street, Dundee. 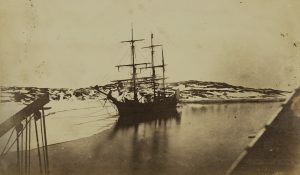 Pre 1841: Carrier in Rattray. Clerk for Messrs J & P Cameron, Carriers in Exchange Street, Dundee. Fish curer working for Mr James Davidson in Candle Lane, Seagate, Dundee. 1842-1845: Business owner, Tait & Yeaman, Fish curers, 12 Horse Wynd, Dundee. 1850 : Business Owner, Napier, Tait & Yeaman, Fishcurers, 12 Horse Wynd, Dundee. 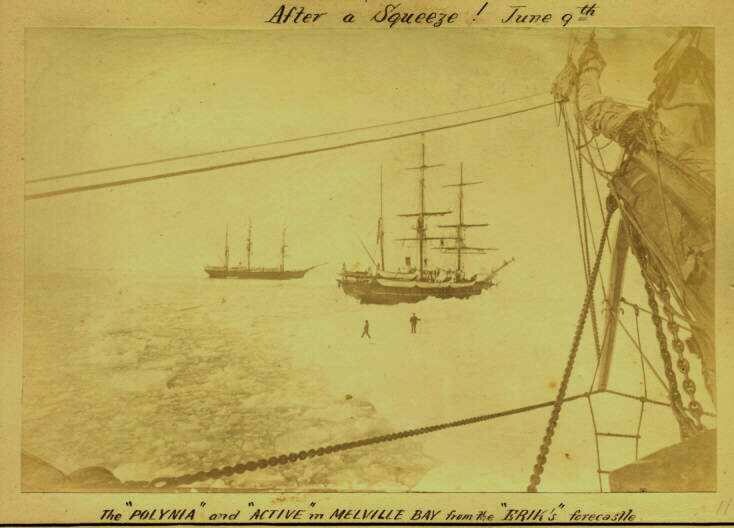 1864: Became ship owner of two whaling ships, the "Camperdown" and the "Polynia." 1867-1872: Joint Manager, with David Bruce in Dundee Seal and Whale Fishing Company. 1868: financed and constructed a bonded warehouse on the west side of Candle Lane which reached almost entirely from the Seagate to Dock Street. 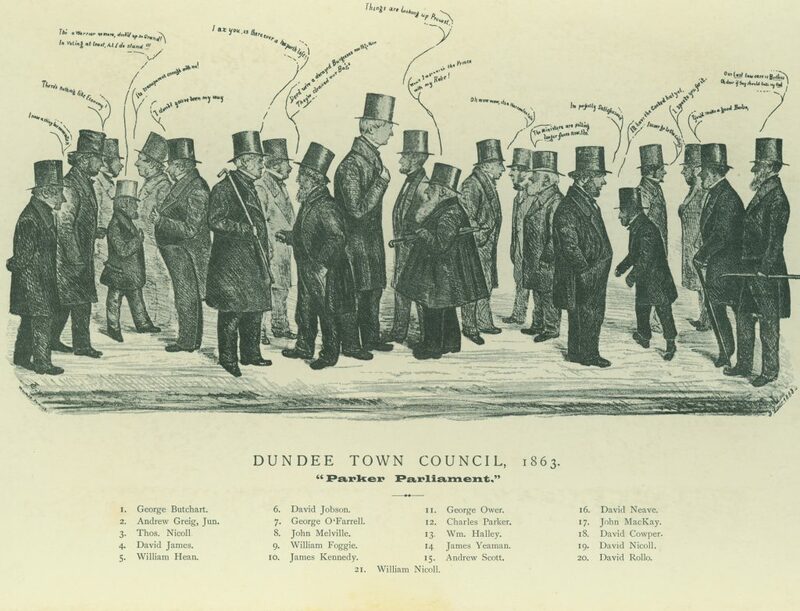 1859: Entered public life on Dundee Town Council. 1873: Became Member of Parliament. James Yeaman was the youngest son of James Yeaman and Margaret Siddie (Sydie) of Rattray, Scotland. James was born on 13 March 1816 at Rattray. He had two sisters, Isabella (born c.1808) and Euphemia (born c.1821), and two brothers John (born c.1810) and David (born c.1812). James’s father worked as a carrier. James Yeaman the younger was schooled in the public school of Rattray. It is thought that James’s working life began with helping out in his father’s business as a carrier. At around the age of eighteen, James moved to Dundee to take up a position as a clerk, working for Messrs J & P Cameron, carriers in Exchange Street, Dundee. James also appeared in early directories as a carrier between Rattray and D. Myles’s Coal-shed in the Seagate, Dundee in 1837-38, before later working for Mr James Davidson who was a fish curer in Candle Lane, Seagate. 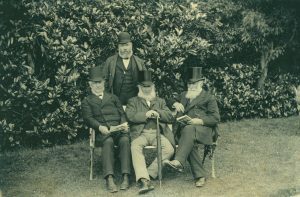 By 1841, James had worked his way up in the fish curing business, and had become an owner in a partnership with Mr Tait. Their business was located at 97 Seagate, Dundee. On 8 November 1843, James married Jane Tullo in Dundee. Jane was the daughter of the late Henry Tullo, a merchant of the town. Over the following years the couple had at least five children, Jane, Margaret, William Tullo, Sophia and James Playfair. Having made a success of his business life, James entered the council around 1859 representing the First Ward, before being made a bailie in 1860. 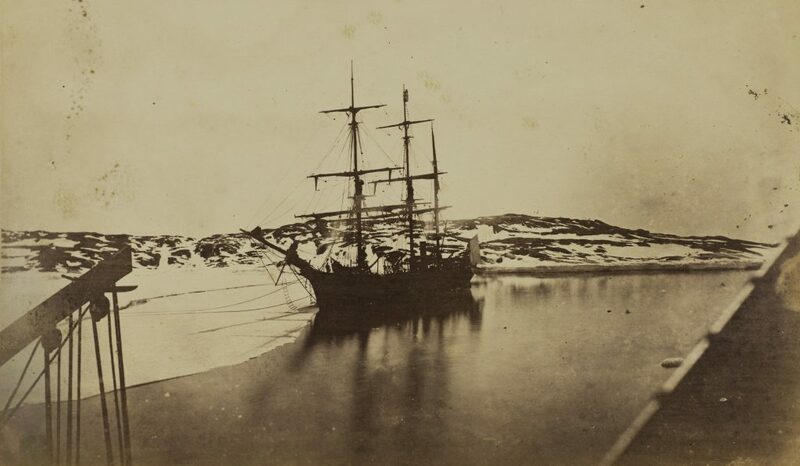 By 1861, James had become a ship-owner owning two screw steam-ship whaling vessels, the “Camperdown” and the Polynia” that both operated out of Dundee harbour. Considered a barbaric practice today, at the time it was viewed differently as many products from whaling were absolutely vital to both the jute industry and for use in the lighting of houses. To James, being in the fish curing business, the idea of owning whaling ships would have been an obvious one. The ships were not used to catch the whales, but to transport the fishermen to Arctic regions and also to transport the catch back to port. The ships were expensive, and whilst the investments were large, it was obviously a lucrative trade. 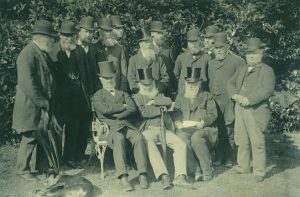 It was during his time as a bailie that James was in attendance at some of the first meetings held in regard to acquiring an area of land on which to found The Albert Institute. There was a degree of controversy surrounding the acquisition of an area of the town’s Meadows for the institute. A Mr Edward had been negotiating with the council to acquire ground for a speculative development when the area was identified as suitable for the memorial to Prince Albert. The Dundee Advertiser reported on the council meeting at which Bailie Yeaman “thought the council would not be acting fairly towards the parties who had offered to purchase the ground if they postponed the sale in the manner proposed by the committee. He was quite favourable to the Albert Institute, but he did not think the town of Dundee was in such a position financially as to enable it to sell any of the ground belonging to it at a price below its real value. He did not think either that the committee of the Albert Institute could say the council were not treating them well if they put up the ground for sale in the ordinary way. He therefore moved that the minute be not approved of, but that the sale go on upon the day advertised. 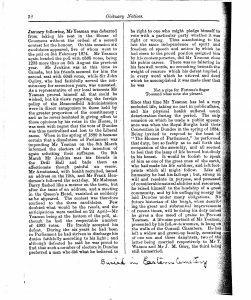 He believed that which ever party obtained possession of the ground, the buildings to be erected upon it would do no discredit to the town of Dundee.” The comment on Yeaman’s position in the same edition left no doubt as to what the newspaper thought of this. “Between a selfish and a philanthropic object – between a private self-seeking speculation and a handsome public offer for the architectural improvement of the town – he had no preference. The great thing in his mind was the price. Like Shylock, he had a single eye to the pound of flesh, and would ruthlessly cut it out of the public generosity ‘nearest the heart’. We are amazed at the position of the Bailie’s. Had an enemy put words into his mouth to lower him in public esteem, that enemy could have said nothing more severe.” Harmony was restored during January and February when it was agreed on the motion of Bailie Yeaman that an upset price of £350 would be accepted from the Albert Institute company and the extra £50 added to the price would be reimbursed by the council when it was out of debt. Thereafter he was a strong champion of making the project a reality, and he felt very keenly that the Institute and the Free Library would be a wonderful resource for the people of Dundee, and that it would encourage learning and culture. 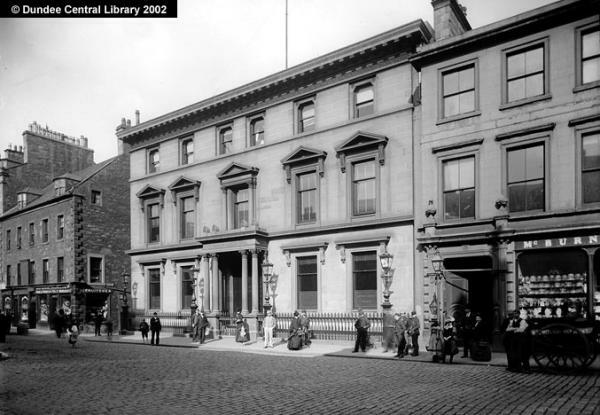 James had also been on the board of the Dundee Public Library in 1869-70..
By 1865 James’s term on Council had reached its end, and he returned to focussing on his private business affairs. It was during this time, that he became joint Manager of Dundee Seal and Whale Fishing Company, which included the use of his ships. 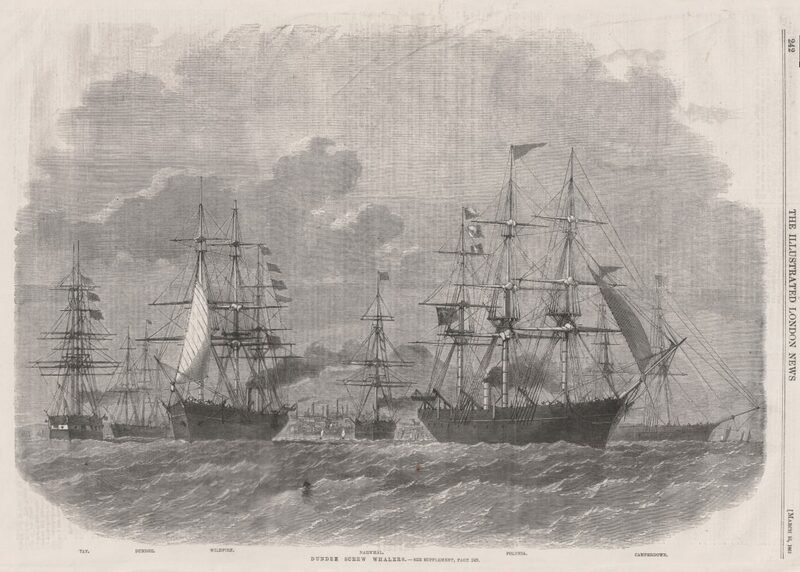 The company gathered two other whalers and a sailing ship “Columbia”. But it seems calls to return to council must have been strong, as James was re-elected to council in December 1868, this time in Third Ward by 2067 votes. Just six months later in July 1869 James was elected ad interim, on the resignation of Mr William Hay, to the office of Provost, being unanimously voted into the position in full later that year. He filled this office until 1872. When the construction of the Albert Institute was nearing completion in 1873, James Yeaman was still attending committee meetings, even though he was no longer a member of council. During the previous decade, James had acquired a large portion of land in the Seagate of Dundee, including sites in Candle Lane and Horse Wynd. Some of these premises formed part of his fish curing business, and some were premises and bond stores let out to others. James lived with his family at ‘Craigie Cliff’, a substantial property on the eastern road out of the town towards Monifieth. Situated at 129 Ferry Road, the site was bound at the rear by the Arbroath Railway line and then the edge of the River Tay; the home was just one property away from the Dundee Orphan Institution. Whilst holding the position of chief magistrate, James expressed the view that the city was lacking in a comprehensive written history. Mr. J.M. Beatts was employed to compile a work from the burgh archives. 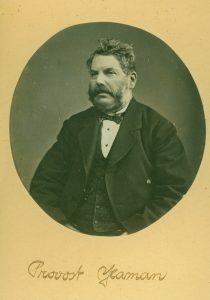 Although he was no longer on council by 1873, James personally undertook financial responsibility for the publication of The Municipal History of Dundee. The author later dedicated the book to James, in appreciation. In 1873 James entered politics after being elected as the Member of Parliament for Dundee, standing for the Liberal party. An independent thinker, and a man of deep convictions, James declared he ‘would not bend to the pressure of lobbyists’, but instead, ‘he would vote for what he felt was in the best interests of the Dundee townspeople’. He was described as being a humble, warm and approachable man. It was during his time in Parliament in 1875, that he learned of the sudden death of his youngest son James Playfair, aged 22, off the coast of Greenland where he was employed as an engineer on a whaling ship. This event deeply saddened James and his family. James’s other son William Tullo had been working in his father’s fish curing business since around 1872, starting as a clerk, and like his father learning the business from the ground up. Throughout his life, James was involved in many of the town’s institutions, some in his role as councillor and M.P., and some in a private capacity including being Deacon of the Bonnetmakers, Harbour Trustee, Dundee School Board chairman, president of the Dundee Horticultural Society, vice-president of the Humane Society, Dundee Hospital Funds Committee, director of the Dundee Institute for the Blind, amongst many more. James Yeaman had been a strong supporter of the founding of the Tay Bridge from around 1869. He felt that it would be advantageous to the interests of the town, allowing a direct connection to the southern side of the Tay and also to the capital, Edinburgh. He was involved in helping to secure financial subscribers during his time at council, and continued to be a sturdy advocate upon leaving Council, to take up his position in Parliament. 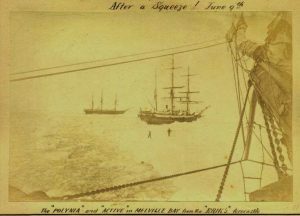 When the bridge later collapsed in a vicious storm (some say hurricane) boasting wind gusts in excess of 124 kph on the evening of 28 December 1879, James was among the first responders, including being onboard the first steamer to man a recovery mission at daybreak. No doubt James felt the subsequent 59* deaths of his townspeople very deeply. He visited the morgue to support grieving families, and he remained serving on the Tay Bridge Relief Fund until his own death. 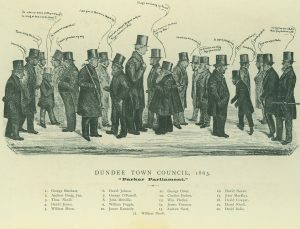 James continued to represent Dundee’s interests as its Member of Parliament, until he was defeated in elections in April 1880. He ran as a Conservative. Accused of failing to lobby as hard as his opponents, he appeared to have spent much of early 1880 dealing with the Tay Bridge disaster, and helping the relief effort. Soon after, James retired from political life, and also from his fish curing business which he had handed over to his eldest son. He did keep a business presence as a merchant, working from an office at 81 Murraygate, and he continued to serve as a Justice of the Peace, and on the Dundee Chamber of Commerce. A portrait by the artist Hugh Collins, was presented to James in appreciation of his services to the council and the town of Dundee, and he, in turn gifted it back to Dundee, where it was hung in the Town Hall. James spent his retirement at his home Craigie Cliff, Dundee, where he died at 12.30 am. on 11 April 1886. His funeral was attended by a large number of townspeople and local dignitaries. He was buried in the Eastern Necropolis. The bells of the Old Steeple rang at intervals during the afternoon, and the flags on many of the public buildings of the town were put at half-mast in honour of his life. 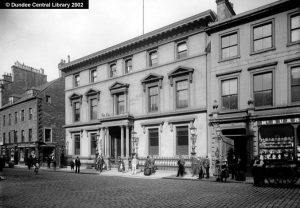 James’s wife Jane from 1878-1887 was a governess of the Royal Orphan Institute which was located almost next door to their home in Ferry Road, Dundee. James Yeaman was also the grandfather of Preston Watson the Scottish aviation pioneer. * The number of deaths is still disputed. Newspaper reports of the time claimed around 80 deaths, current research estimated the toll at 59 deaths. Old Parish Record. Rattray, Perthshire. Baptism. 24 March 1816. 389/20 282. ScotlandsPeople website. Old Parish Record. Dundee. Marriage. 8 November 1843. 282/230 100. ScotlandsPeople website. Scotland Births and Baptisms, 1564-1950. James Yeaman in entry for Jean Yeaman, 21 Sep 1855. FHL microfilm no. 6,035,516. FamilySearch website. 1841-1881 Censuses Scotland. ScotlandsPeople website. Dundee Directories, 1850-1855. Local Studies, Central Library, Dundee. Statutory Record. St Andrew, Dundee. Death. 11 April 1886. 282/4 317. ScotlandsPeople website. 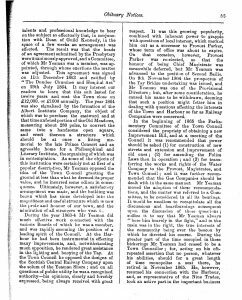 The Dundee Courier and Argus, Thursday, 15 April 1886. Funeral of the late Mr Yeaman Ex. MP. British Newspapers Online. Dundee Courier and Argus, Thursday, 15 April 1886. British Newspapers Archive website. Dundee UK Parliament Constituency. Wikipedia website. Dundee Directories, 1861-1886. Local Studies, Central Library, Dundee. Dundee Directories, 1873-1886. Local Studies, Central Library, Dundee. Dundee Town Council Minutes, 1859-1872. Dundee City Archives. 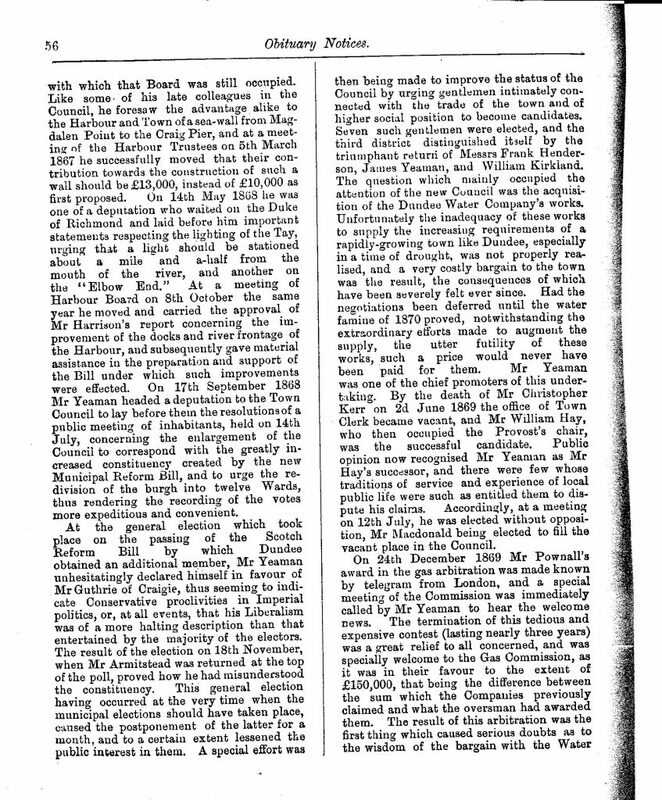 Dundee Town Council Minutes, Volume 28:1859-1864. Dundee City Archives. Miller, A.H. (1887) Eminent Burgesses of Dundee 1513 - 1886, Dundee, Scotland. p.281. Dundee Voters Roll. Friends of Dundee City Archives website. Dundee Valuation Roll, 1871-72, District 1. Dundee City Archives. Miller, A.H. (1887) Eminent Burgesses of Dundee 1513 - 1886. Dundee, Scotland. p.281. Dundee Directory, 1861-1862. Local Studies, Central Library, Dundee. Dundee Directories, 1867-1873. Local Studies, Central Library, Dundee. 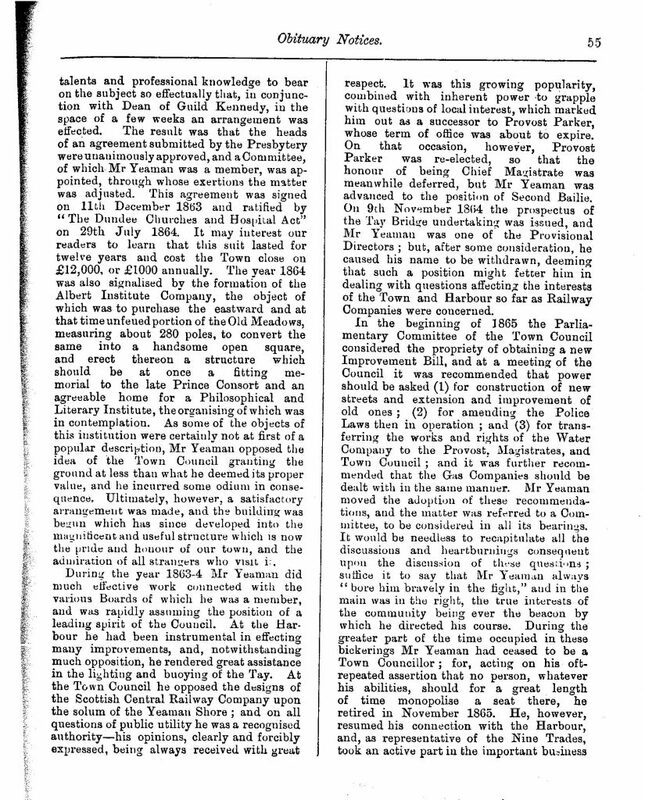 The Dundee Courier and Argus, Friday, 14 February 1868. Opening of Mr Yeaman's Bonded Warehouses. British Newspaper Archive website. Dundee Valuation Rolls 1871-72, District 1. Dundee City Archives. 1851 Census Scotland. Rattray, Perthshire. 389 ED1 p.11. ScotlandsPeople website. 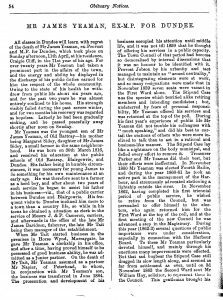 The Northern Warder and Bi Weekly Courier and Argus, 13 April 1886. British Newspaper Archive website. Dundee Directories, 1837-1838. Local Studies, Central Library, Dundee. 1851 Census Scotland. Dundee. 282 ED11 p.1. ScotlandsPeople website. Scotland Births and Baptisms, 1564-1950. 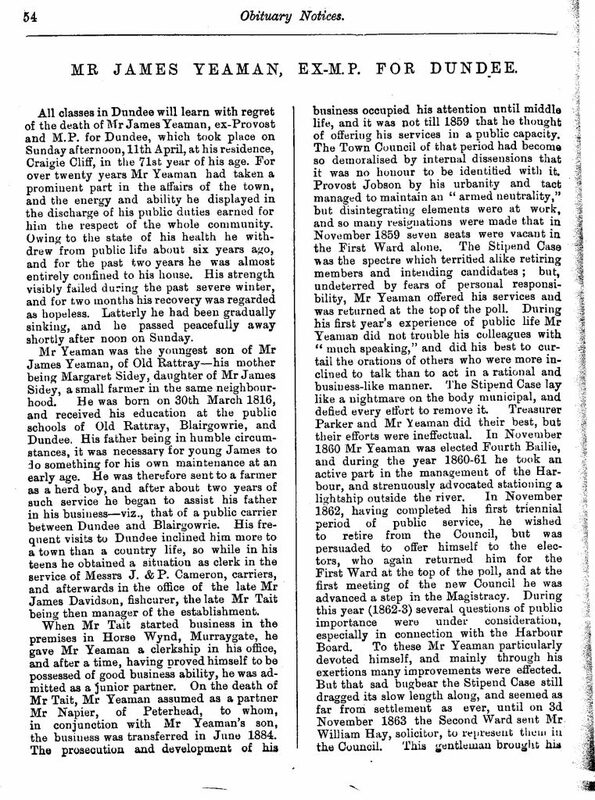 James Yeaman in entry for Margaret Yeaman, 25 Aug 1844 FHL microfilm nos. 993,405, 993,408, 993,403, 993,408. FamilySearch website. Dundee Whaling Industry 1756 to 1920. Friends of Dundee City Archives Website. Dundee Advertiser, Tuesday, 19 January 1864. British Newspaper Archive website. Dundee Courier and Argus, Tuesday, 23 August 1864. British Newspapers Archive website. Dundee Advertiser, Friday, 25 December 1863. British Newspaper Archive website. 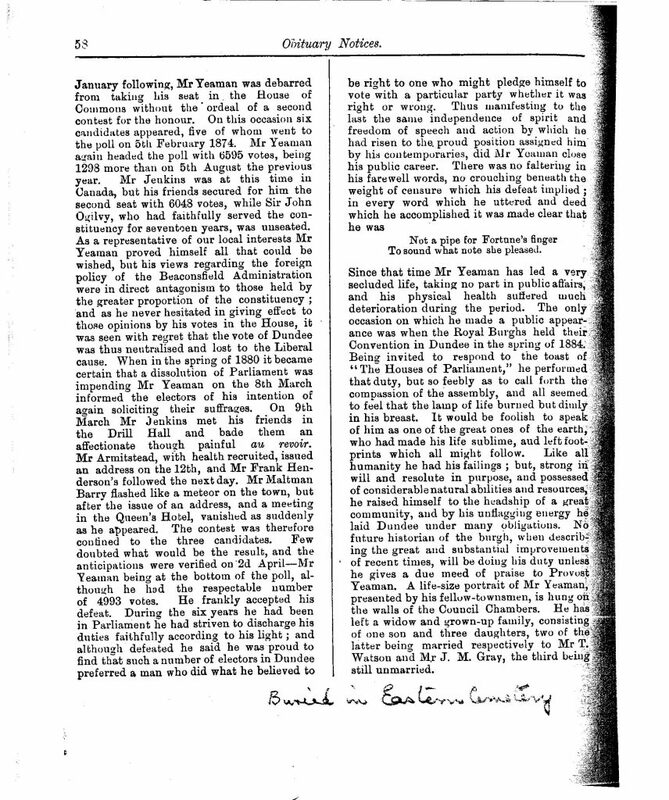 Dundee Advertiser, Tuesday, 19 January 1864 and Tuesday, 2 February 1864. British Newspaper Archive website. Dundee Directories, 1869-1870. Local Studies, Central Library, Dundee. Dundee Directory, 1867-1868. Local Studies, Central Library, Dundee. 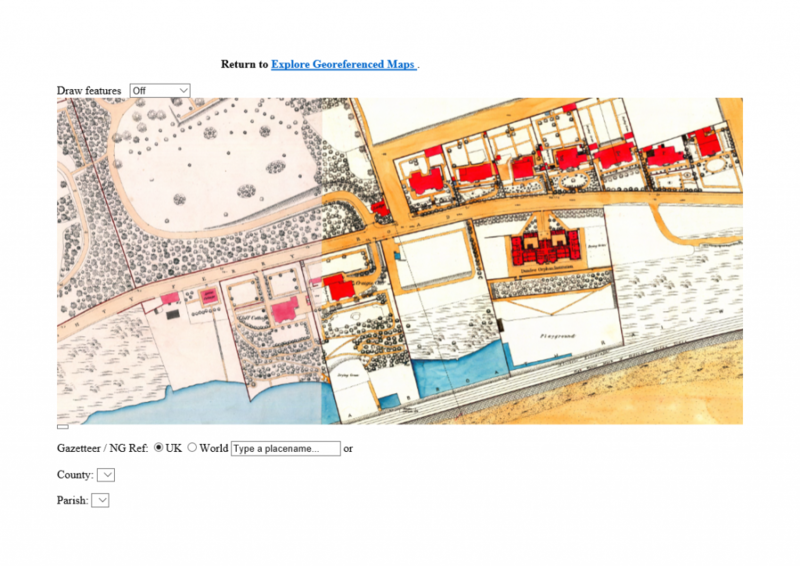 OS Large Scale Scottish Towns plans, 1847-1895, Dundee 1872-LIV.6.14. National Library of Scotland website. Beatts J.M, (1873) The Municipal History of Dundee. Dundee. Published by the proprietor, at 57 Reform Street, Dundee, Scotland. This book is dedicated to James Yeaman Esq., M.P. The Dundee Courier and Argus, Wednesday, 20 October 1875. Fatal Accident to Mr James P. Yeaman, son of Mr Yeaman M.P. British Newspaper Archive website. Dundee Directory, 1872. Friends of Dundee City Archive website. 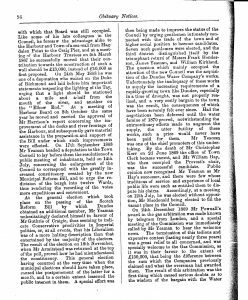 Dundee Courier and Argus, Friday, 26 November 1869. The Tay Bridge. British Newspaper Archive website. Dundee Courier and Argus, Tuesday, 30 December 1879. British Newspaper Archive website. Dundee Courier and Argus,Tuesday, 30 December, 1879. British Newspaper Archive website. Dundee Courier, Thursday, 10 January, 1880. British Newspapers Archive website. Dundee Courier and Argus, Thursday, 15 April 1886. British Newspapers Archive websiteOnline. Dundee Courier and Argus, Friday, 27 September 1872. British Newspapers Archive websiteOnline. 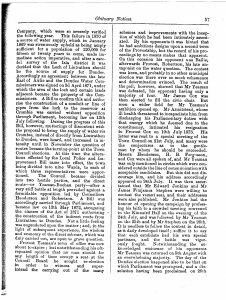 Edinburgh Evening News, Monday, 12 April 1886 and The Northern Warder and Bi Weekly Courier and Argus, Tuesday, 13 April 1886. British Newspaper Archive website. Dundee Weekly News, Saturday, 4 June 1881. British Newspapers Online. 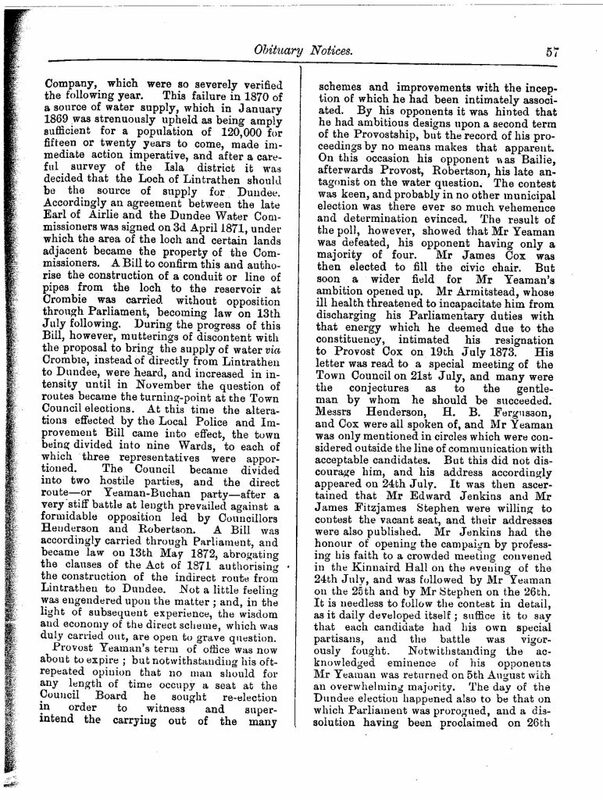 Leeds Times, Saturday, 17 April, 1886. British Newspapers Online. Aberdeen Press and Journal, Thursday, 29 April 1880. British Newspapers Archive websiteOnline. Dundee Directories, 1878-1887. Local Studies, Central Library, Dundee. From various sources, both primary and secondary, including Grace's Guide to British Industrial History website. Thanks to Mr Stephen Connelly for his assistance in accessing records in Dundee City Archives and Local Studies, Central Library, Dundee. The information above about James Yeaman has been collated from a range of digital and hard copy sources. To the best of our knowledge it is correct but if you are relying on any information from our website for the purpose of your own research we would advise you to follow up the sources to your own satisfaction. If you are aware of an inaccuracy in our text please do not hesitate to notify us through our Contact page.